Another quick paint job completed during the heat of the last few weeks is this Reaper Bones figure – Virina, Female Demon. The soft plastic used in the Bones range is notorious for poor detail, particularly on faces. To be fair this was no worse than previous Bones miniatures I’ve painted. The face wasn’t too much of a problem but the hair proved to be poorly detailed. On a similar demonic note no prizes for guessing what I have planned for this little pile in the future. 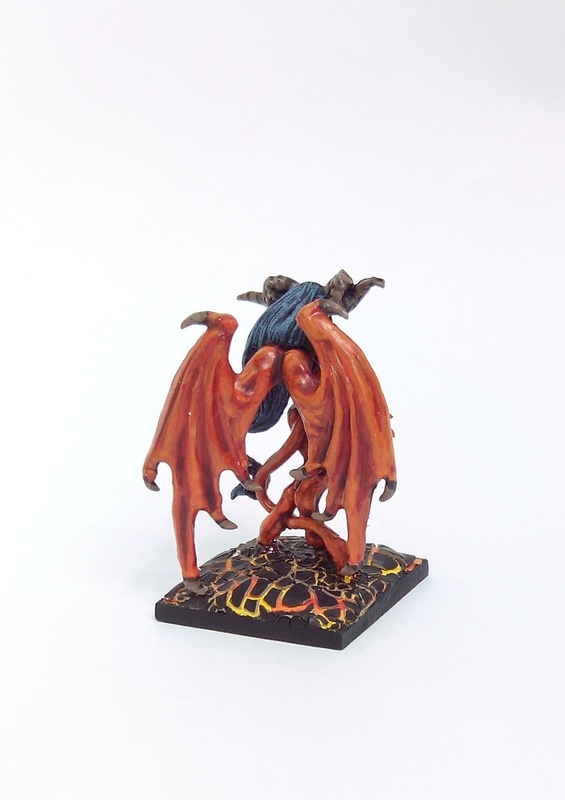 This entry was posted in Post-1990 and tagged Demon, Reaper Bones, Virina on July 24, 2015 by Hobgoblin Orange. Lots of people seem to be trying the new GW Age of Sigmar game. I decided to let the dust settle and see how people found it before making any comment. Many of the reviews I’ve read are from people willing to cast aside their old GW prejudices with a genuine want to enjoy and engage with AOS. A new game that players can get in on from day one – a fresh start so to speak. I’ve found that both positive and refreshing, two words often missing from the closed ranks of gamers, some of whom are all too fearful and suspicious of change within their favourite rulesets or game worlds. 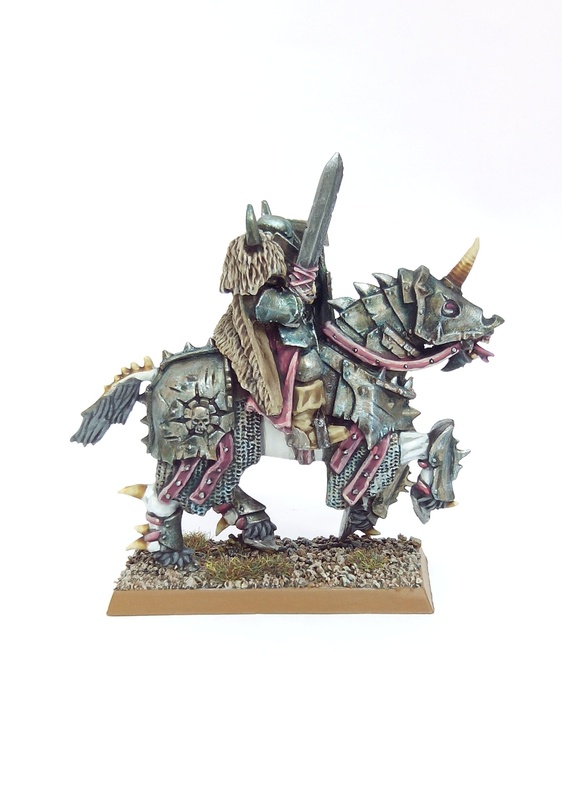 Admittedly these suspicions have sometimes proven correct when armies that people have invested serious money and time in have been rendered obsolete or unplayable by simple codex changes between Editions but at least AOS is a clean broom at this point. Whereas they all seem to agree that the game is lacking depth, hardly surprising from a 4 page ruleset, the real worry for GW should be the apathy some players have felt towards it MID GAME. As a company they rely heavily on player’s enthusiasm for their game worlds and systems, encouraging them to come and play regularly in their stores and pushing new models for players to add to their forces. This becomes an impossible task if players can’t even get half way through a game without caring anymore. I’m sure GW have plans to rectify the short comings of the rules with additional updates. Keeping players interested in the system as a whole will be the real test. Time will tell. As far as the models go I certainly wasn’t the first out of trap to notice that the majority of these models are basically Space Marines without Bolters. I found that disappointing but not unexpected. Everyone else seems to really like them. What is a shame, although again not in the least bit surprising, is that with the arrival of AOS Warhammer Fantasy Battle has finally expired. The spasms of it’s 8th Edition death throes were seemingly it’s last. I’m sure most gamers have a soft spot for whichever Edition of WFB they first played when they entered the hobby, even if they haven’t actually played it since those days. But hey, 33 years and 8 Editions was a bloody good production run and I don’t think it’ll sink into obscurity any time soon. 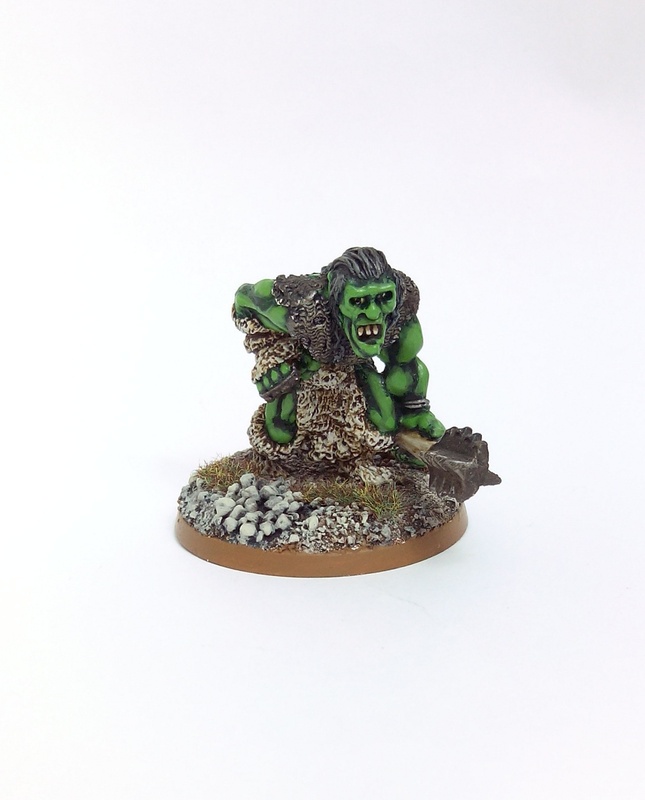 If something as wearing to play as 3rd Edition can create a movement as well populated as Oldhammer I can only assume the later, less clunky versions will still have active fan bases for years to come too. 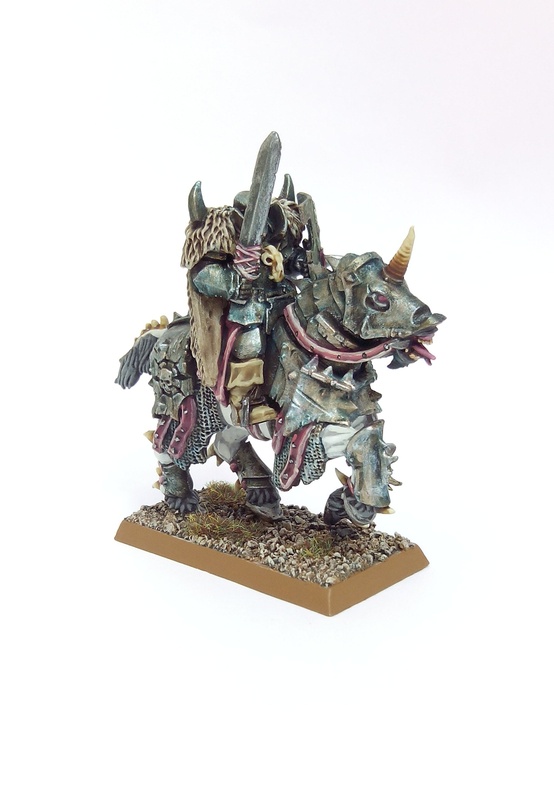 For now I’m giving Age of Sigmar a miss. The starter set seems reasonably priced to begin a new game and start afresh, something that GW haven’t attempted for many years now, but the game system seems seriously flawed. The models alone could warrant the £75 price tag but despite the large number of miniatures in the set I’m not keen on any of them. As much as I’d love to be counted in I can’t bring myself to overlook any of this to take the plunge. Sorry GW I’m out. 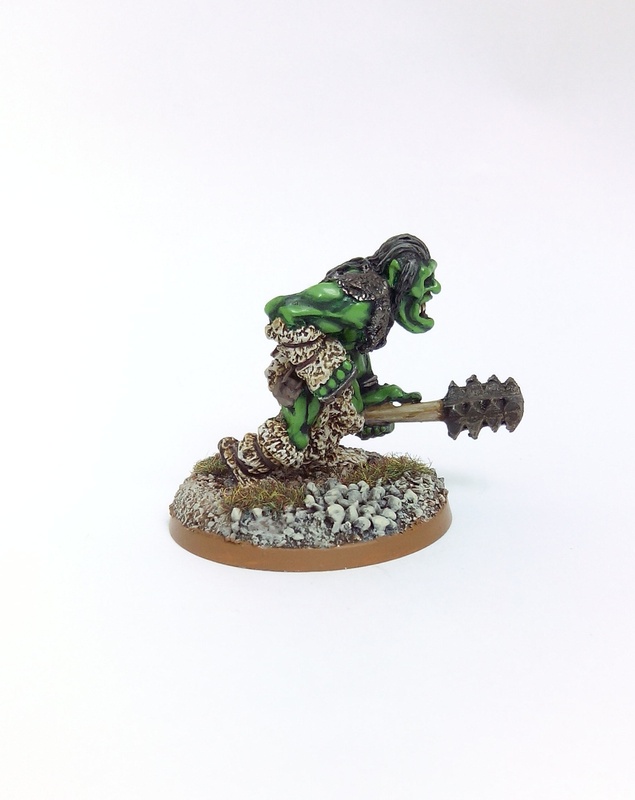 Anyway, as the title implies I’ve also finally gotten around to painting the third troll in my collection to finish ‘The Triumvirate’. 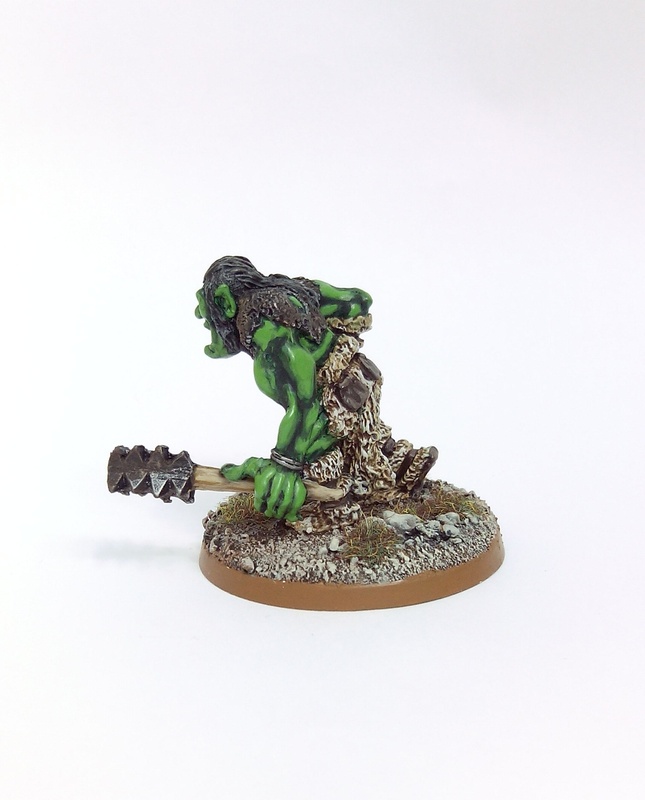 He’s painted up to match the other two trolls I’ve done and will eventually form a unit in the Nick Lund Orc army that’s planned as my main project for next year. 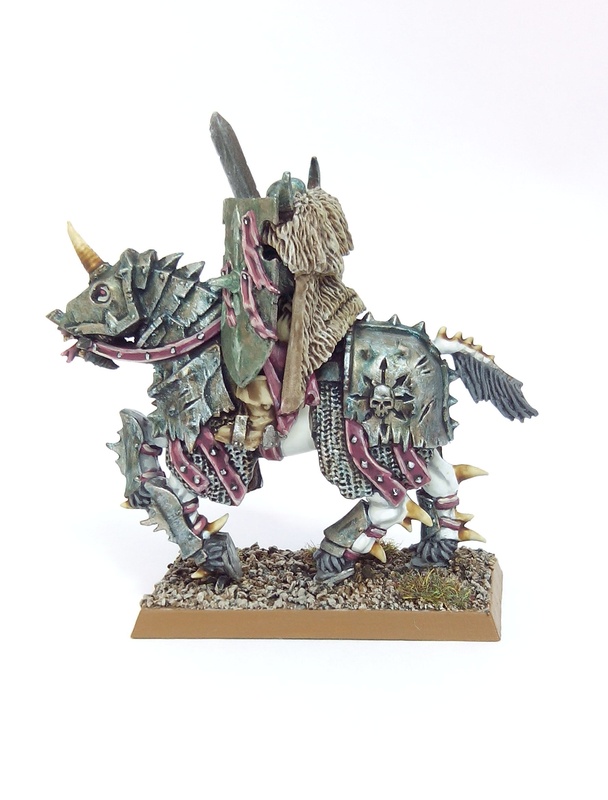 This entry was posted in 1985-1990 and tagged Age of Sigmar, Grenadier, Warhammer on July 17, 2015 by Hobgoblin Orange. 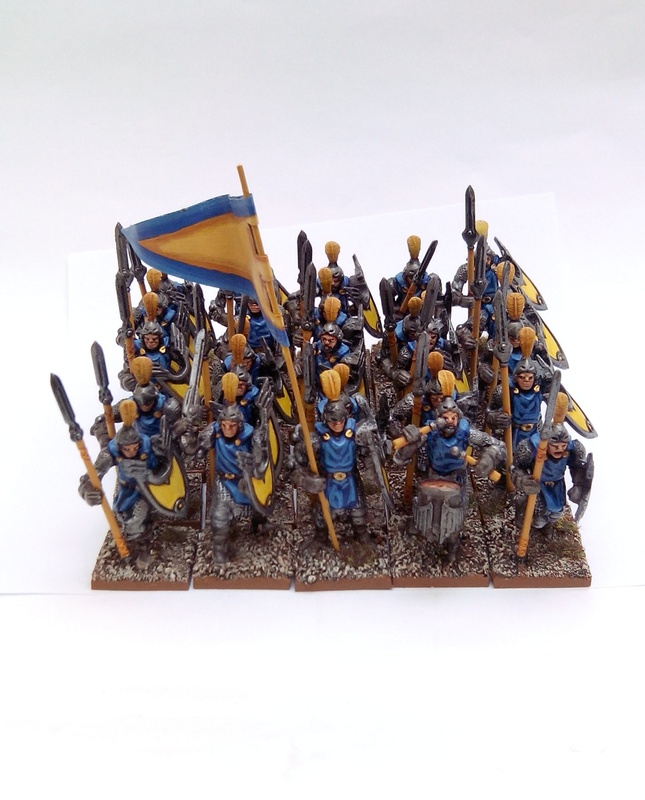 I bought some Mantic Basileans last year hoping to use them as a cheap proxy for Citadel’s old RR17 Avenging Knights of the Cleansing Flame set. They were awful to assemble – heavy mould lines, poor fit on the joints and weapons that didn’t sit in their hands snugly. The moulding detail was poor by today’s standards. In fact that’s not entirely accurate, the moulding detail was poor by the standards of 20 years ago. I’d bought an extra sprue of 5 figures off eBay in addition to the box of 20 to use as command figures. I had to base these on standard 20mm MDF squares as they didn’t come with the Mantic bases that you get when you buy a full box. With hindsight I wish I’d based them all on MDF bases, but more of that later. With the full box, in addition to the 20 figures and bases, you also get a few extra white metal items. These comprise a standard, a drum and 2 arms holding drum beaters. You can use them to convert two troopers into a Standard Bearer and a Musician. 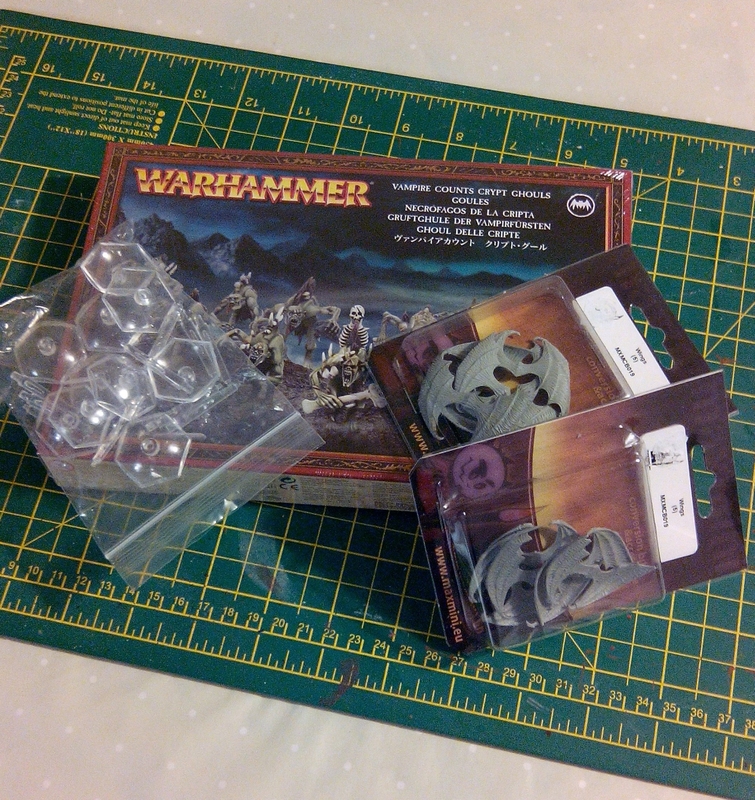 I also bought a standard MDF 20mm 5 x 5 base movement tray to fit all 25 figures in. Imagine my joy at discovering that the Mantic bases are just slightly bigger than standard 20mm GW or Laser cut MDF bases so they wouldn’t fit in the tray. There was no way I was going to sit and file minute amounts off the base edges so I bought some Renedra trays that would hold 20 Mantic based troopers. I plan to get a separate small MDF tray for the command figures that I’d based on standard 20mm MDF – at least they’ll fit in a normal movement tray. Enough was enough and I needed to get this lot off the shelf of shame and finished to some sort of acceptable level. 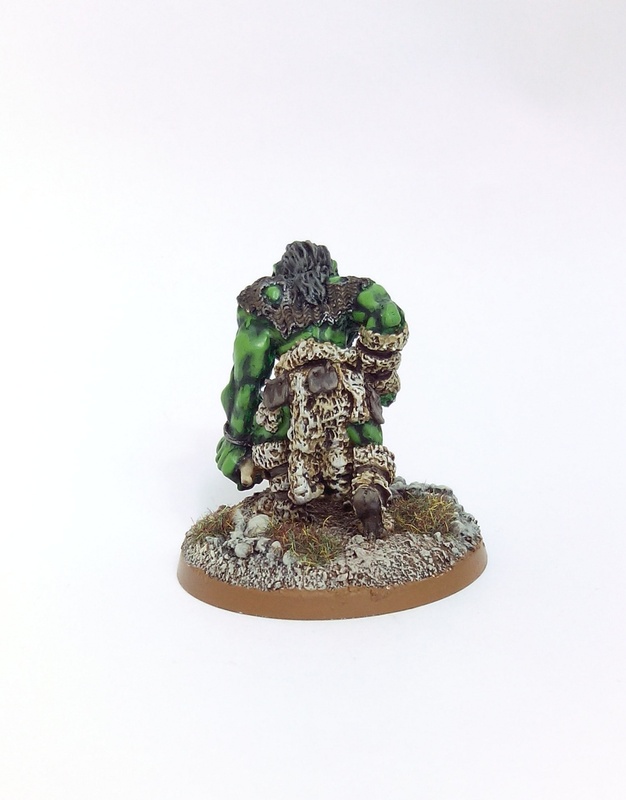 I realised I was never going to get the results I’d have liked from them so I decided to bite the bullet and go for ‘wargaming standard’ rather than relinquishing huge amounts of time and effort on them. Before repainting them I ripped off the unwieldy metal standard and replaced it with a length of florist’s wire for a paper banner. 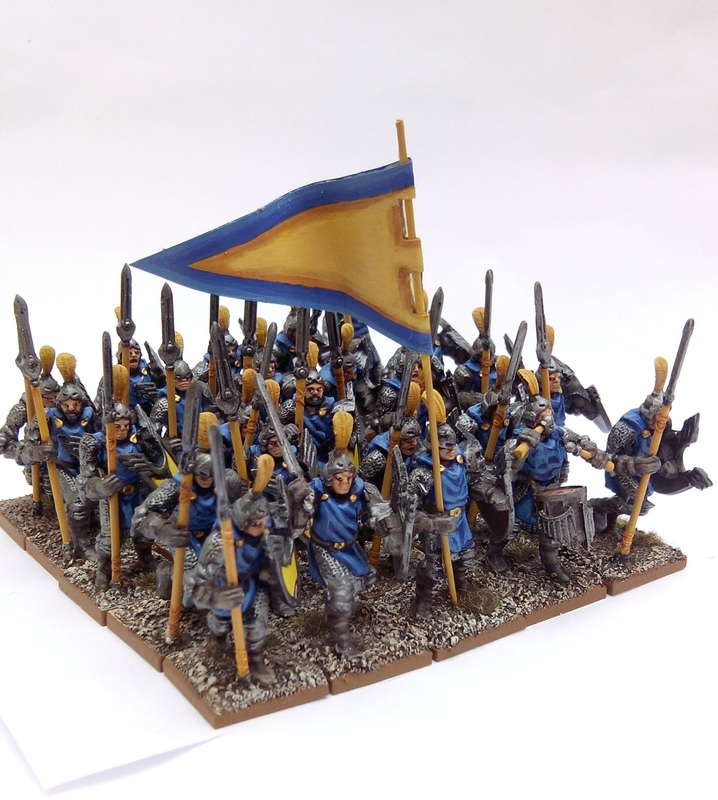 Thinking back to the Wargames Foundry Men at Arms miniatures I’d previously painted I decided on a blue and yellow colour scheme. 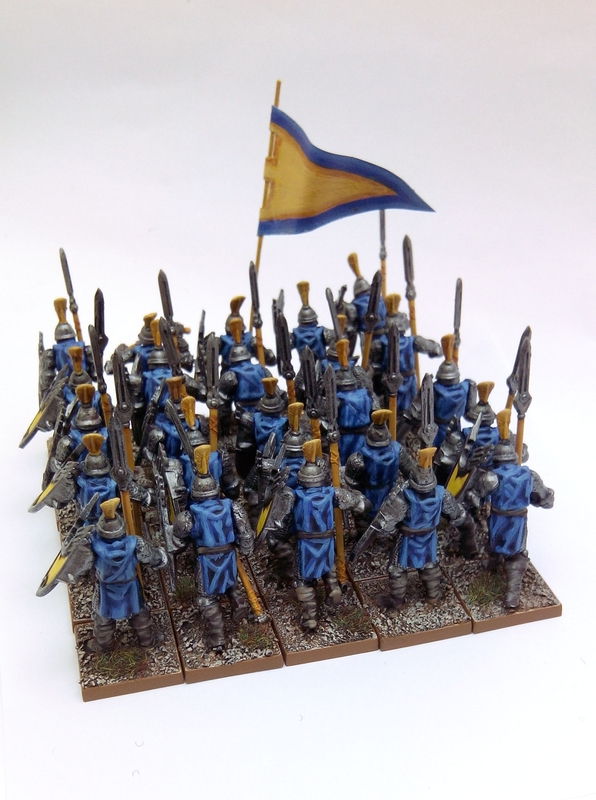 Although the jupons and shields on these could easily take more complex colour schemes and heraldry there was no way I was prepared to risk losing the will to live any further by adding complications to the paint job – even the thought of adding a blue line to each of the 24 shields to break up the yellow filled me with a sinking feeling. 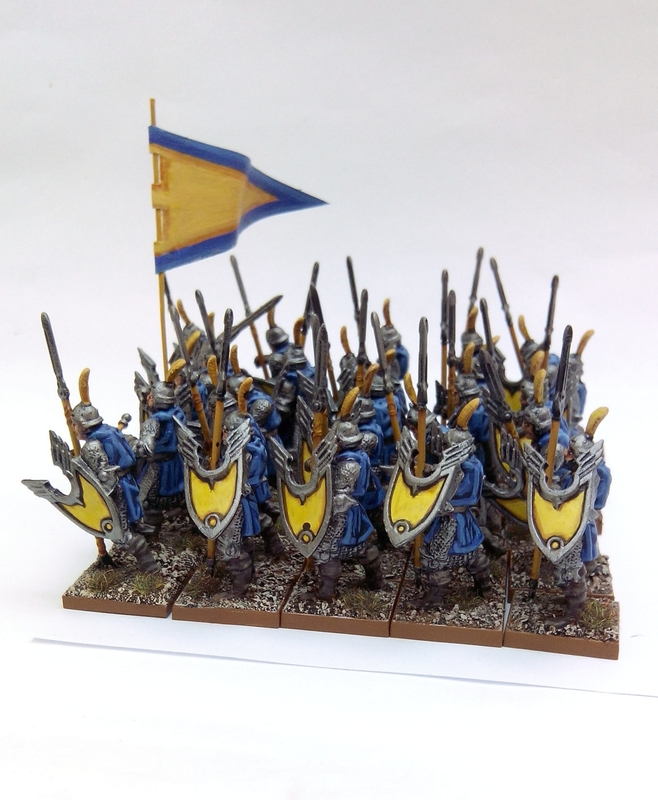 So keeping to a simple paint job and girding my loins against their general awfulness I managed to eventually turn these into a serviceable regiment of High Fantasy spearmen. In Mantic’s defence these are priced relatively inexpensively in comparison to other manufacturer’s ranges of 28mm multi pose plastic figures, hence I was on them like a spinster at the wedding bouquet toss. However the photos on Mantic’s website flatter them greatly, they don’t hold up to close scrutiny. These would probably be perfect for base coat dipping to getting a playable army on the table quickly rather than lavishing time and effort on these as individual miniatures. They’d best be described as ‘functional wargaming figures’. As far as my original intention of using them as a proxy for Avenging Knights of the Cleansing Flame I think it’s back to the drawing board. 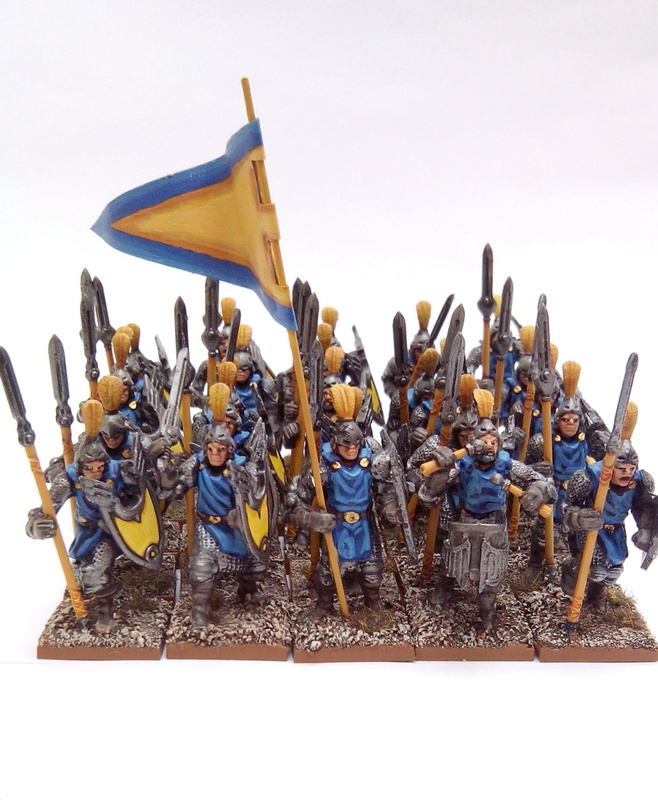 The early 90s GW High Elves with Spears option might be a better idea rather than risk another regiment of these gathering dust for 8 months. 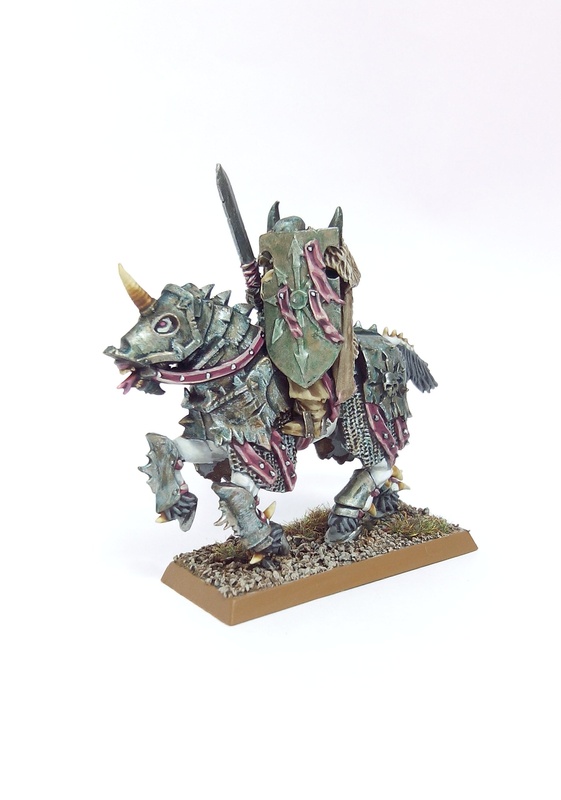 This entry was posted in Post-1990 and tagged Basileans, Mantic on July 5, 2015 by Hobgoblin Orange.